The cost of laser printers has come down dramatically over the years, making it more of an easy purchase than ever. For students and those just setting up a new home office, this means a mass printing device can be bought for very little initial outlay. For a busy office, a laser printer is a no-brainer. It provides the best text quality prints, the fastest speeds, and the most economical prints on a per-page basis. If you’re in the market for a new laser printer or laser-based multifunction device, here are 10 things to consider before buying, ranging from what features you should be looking at, to the total cost of ownership. Your first criteria is your basic need: ask yourself what types of documents you will be printing to determine the type of printer that will suit you best. If you only want the ability to print, and if you will only be printing things such as invoices or other monochrome documents, then all you’ll need is a monochrome laser printer. Go for a colour laser printer if you will also have a need to print colour documents on a regular basis. If you have a need for scanning documents, making copies, sending and receiving faxes, then you will need to consider a multifunction laser printer that can perform all of these tasks. Furthermore, you may want to look into other types of functions such as printing from USB sticks (file support can vary, so check the specs), scanning to USB sticks and network locations, and perhaps the ability to print and scan using Cloud-based apps. Commonly, printers will handle paper up to the A4 size, so you will have to look for a specific model if you want to be able to also print documents on A3-sized paper. Things such as envelopes and heavier paper can be printed if the printer has a multi-purpose tray, and you will need to check the printer’s specifications to see exactly the weight of the paper that it can handle (in gsm), as well as the number of envelopes that can be loaded. For a busy office, having enough paper in the printer at all times is a necessity. No one ever wants to be one to have to fill up the trays, so the best you can hope for is for the tray to not require regular filling. Look for a printer that has an appropriate capacity for the number of users who will be printing (many office printers come with a standard tray of 250 sheets). Also, look for a printer that can be expanded via a second or third tray to satisfy growing needs. At the same time, look for other paper handling characteristics that may concern you. This can include the ability of the printer to print on both sides of the page automatically (via a built-in duplex unit), and also the ability to scan or copy multi-page documents via an automatic document feeder (ADF). USB is standard on all printers, but for an office environment, the key type of connectivity you should look for is Ethernet. This will allow you to plug the printer in to your network router and share it among the workers in your office. The printer’s driver will need to be installed on all the computers in the network that will require access. Look for wireless connectivity (usually up to 802.11n specification) if you would like to set up the printer on your wireless network instead. Furthermore, look for Wi-Fi Direct capability if you would like to give mobile devices a way to communicate with the printer directly and print via an app. This can work with NFC functionality on some printers, allowing the direct connection to be set up by placing the device on the printer to pair it. Ensure that the printer supports all the devices that will require access in your office, be they Apple devices, Android devices, or even Windows Phone. Printing from Cloud services is also supported in many printers these days. Check up on the services that a printer supports, which could make it easier to print from places such as Google Docs, Dropbox, OneDrive, and other online services, without having to go through a computer or mobile device. Brother is one vendor that includes these types of services on its entire range of colour laser printers. You’re probably used to the touchscreen on your phone, tablet, or perhaps even laptop. So why not go for touchscreen on a printer? A touchscreen can make it easier to navigate a printer’s menu system, especially if it has built-in access to apps that require the user to punch in their login details. Ease of use can also encompass the swiftness with which the paper tray can be accessed and loaded, and the way in which the toner cartridges can be changed. The initial cost of a laser printer may be very low these days for some models, but it’s the overall total cost of ownership that you need to be aware of. This includes things such as the cost of replacement toner (for each colour), the yield of the toner (how many pages it can print), and the cost of any other consumables that are associated with the printer, such as a fuser (the unit that fixes the toner to the paper) or drum unit (which transfers the toner onto the paper). Many laser printers only have the one consumable these days, which is the toner. You should also consider if a printer can take XL or super-high yield cartridges, which can offer a better overall cost per print and a longer duration before the toner needs to be replenished. 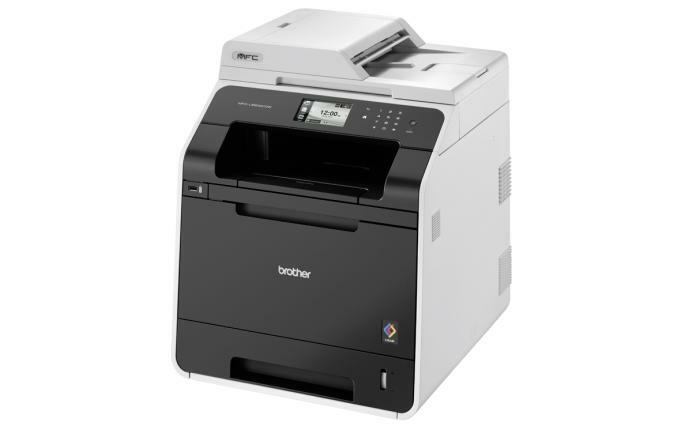 Examples of printers with super-high yield cartridges include the Brother MFC-L9550CDW, which offers running costs of 3.2 cents per monochrome print, and 12.7 cents per colour print. Noise emissions can be a hard one to evaluate unless you see the printer in action at a showroom or retailer with a low noise floor, but it’s something that you must be mindful of, especially when purchasing a big printer. The noise when the printer’s engine starts up and churns through a print can be significant. Some printer manufacturers (Brother is one of them) list a noise level (in decibels) for different models, which you can use as a guide to figure out how loud it will be when set up in your environment. For example, the Brother HL-L2300D has a noise level of 49dB or less when printing. Power usage should also be a consideration. In particular, you should look for a printer that has a deep sleep mode, and also assess how much power the printer uses when it’s actively printing. Look for a model that is Energy Star compliant. Read more Laser vs. inkjet printers: which is better? The duty cycle is the number of prints that the printer is rated as being able to print on a monthly basis. It’s a rating that should be looked at if you will be doing a large volume of printing on a regular basis. This rating can be anything from 1000-5000 pages, all the way up to tens of thousands. While it’s not easy to compare processors between laser printers, the quoted speed in megahertz can give a good indication of the power the printer has to process jobs and run its inbuilt functions. Furthermore, the memory capacity (and a printer with upgradeable memory) is key if you will be printing from graphics and design applications, especially when using PCL or PostScript languages for printing, for which space is needed to store the print information as it is converted. A typical printer for an office can be bulky and perhaps difficult to move around without the help of another person. Consider the size of the printer in your purchase and where you will be installing it in your environment. You may end up wanting to look for a more compact printer that better suits your office space while still providing similar functionality. Furthermore, you might want to assess how easy it is to install its toner cartridges and load its paper, as this can help minimise maintenance time.